2015 Challenge: Henri de Toulouse-Lautrec, "Jane Avril"
This year, the Ripoff Artists jump in with both feet to take on one of the world's best-known, and least-understood, artists, Henri de Toulouse-Lautrec (1864-1901). In a very brief career spanning less than 20 years, he produced thousands of works, and was one of the first artists to create commercial graphic art. He did over 300 posters for cabarets and clubs in Paris. His style influenced graphic art for decades, and became the touchstone for graphic design well into the twentieth century. The piece chosen by the Ripoff Artists is a sketch he did for a poster advertising the dancer Jane Avril performing at the Jardins de Paris in 1893. This sketch, and the poster itself, are well-known. The poster was printed as a lithograph, in which the image is drawn directly onto a stone using something like a wax crayon. Every colour in the image requires a different stone, and a separate run through the press, so a seemingly simple design like this one required at least 4 runs, one for each colour including black. The image combines flat areas of colour with fine line, and areas of texture. The floorboards create a very strong diagonal, while the outline of the head of the bass in the foreground becomes the frame for the entire image, while the stylized head of the bass player is outside the frame. As with many modern photos, the foreground is left undefined and the background nearly blank, so we focus on the real subject, Jane Avril in one of her trademark poses. Yet cameras of the time didn't offer this depth of field. 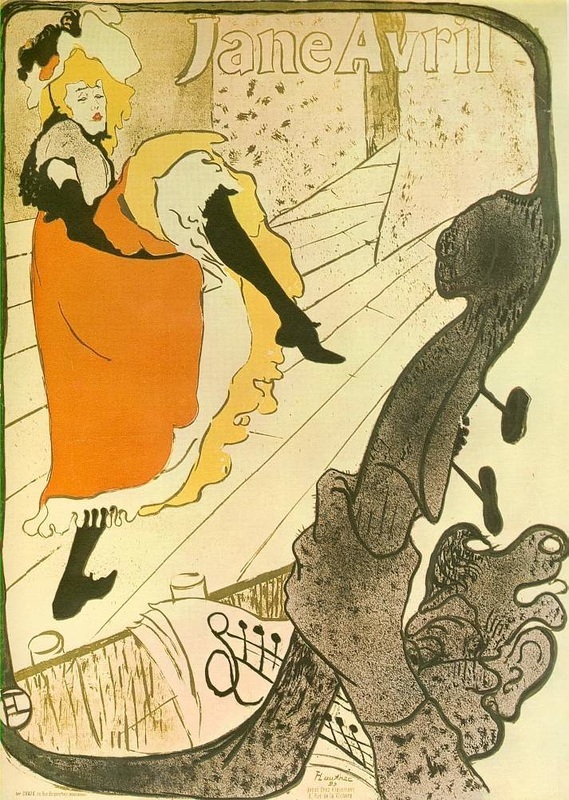 Toulouse-Lautrec and early graphic designers helped create what has become a standard technique for framing an image and placing it in context long before photographic equipment existed that could do this. Some art critics see Toulouse-Lautrec as one of the first twentieth century artists even though he died in 1901, because his style and approach to his subject matter influenced generations of artists, including Pablo Picasso. Click here to see our pre-piece, the work we create to display at the beginning of our week.